Blog › World Masters 2015 - Why not organise your own snooker games tournament or competition? Did you see Ronnie O'Sullivan, one of the all time great snooker champions, withstand an epic Judd Trump comeback and a broken ankle, to claim a fifth UK Championship title? 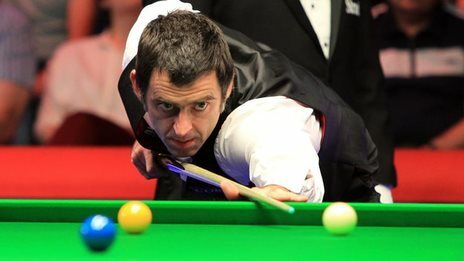 Watch Ronnie O'Sullivan make a maximum 147 break against Matthew Selt in the last 16 of the UK Championship in York. I wonder if Ronnie, or one of the other snooker champions, will win the 2015 Masters snooker world championships held at Alexandra Palace in London from 11th to 18th January? Or will it be an underdog or a relatively unknown player? Snooker is such an addictive sport, to watch on TV, to play in your local club or at home. Could you win a snooker championship? Are you having family and friends around for Christmas or holding a children’s birthday party? Do you have a snooker table? Why not organise your own snooker games competition? Download FREE bracket sheet templates for single elimination or double elimination. Available bracket sizes from 4 to 64 competitors. We have a vast range of value for money, superb quality snooker trophies for all levels, abilities and occasions. We also offer FREE personalised engraving with all our trophies.